Have a rusty, broken, or leaky faucet? We can fix that too. It may seem like a simple fix or a great “DIY project” but replacing or repairing a faucet is best left in professional hands. A simple project can turn into a larger problem. Though a leaky faucet may seem like a minor problem, you can be wasting as much as 200+ gallons of water a month. This also may be an indication of other plumbing problems. When our techs arrive to your home, we will carefully inspect the area, fix the problem immediately, and address any larger issues. We will provide you with clean and fresh water from your faucets in the kitchen and bathroom whenever you need it. 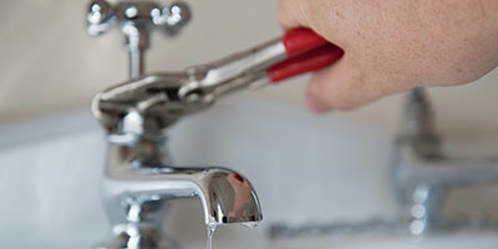 If ever one of your faucets break down, don't hesitate and call us immediately. Stop throwing your money down the drain and give us a call today! How Will I Know If My Faucet Needs Replacing? If a part, such as the handle won't work anymore. The problem may be in the screen which covers the tip of the faucet - aerator. This may be seen on the surface of the faucet.